The Archaeologists of Egypt and Germany have discovered a towering 26-foot tall statue in a Cairo slum, which is likely a depiction of Pharaoh Ramses II, he is considered to be one of the most powerful rulers of ancient Egypt. 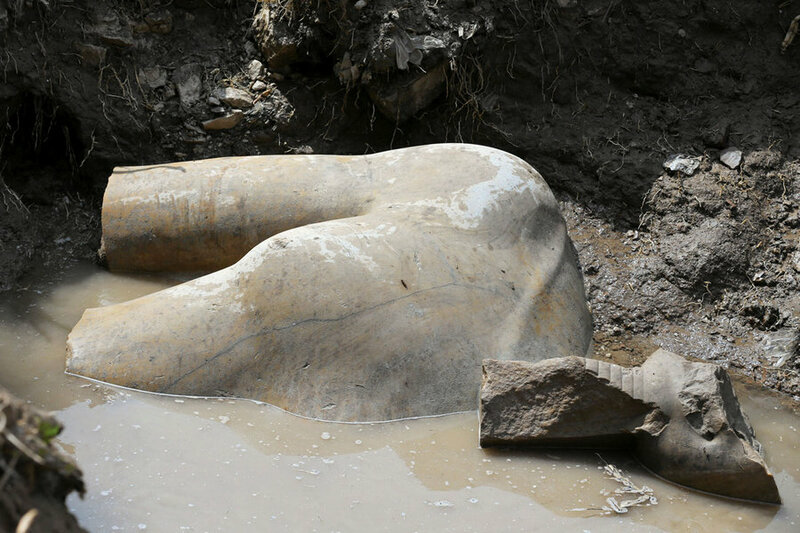 While the colossus was found flooded in mud in where the ancient city of Heliopolis once stood itis “one of the most significant discoveries ever,” according to the Egyptian Antiquities Ministry. As per the reports, this massive quartzite figure is "most probably Ramses II," Antiquities Minister Khaled al-Anani confirmed to Reuters on Thursday at the site of the statue's presentation. While adding to the identity he added that; there would have to be alater confirmation once more of the statue is uncovered. According to the portions discovered;there was no inscription found that would make it promising to decide which king it was,” However, aswe discovered the statue in front of the gate of the temple of Pharaoh Ramses II, it suggests that it is likely him - adds Mr. Anani. In addition to the larger than life statue; the researchers also found a life-sized limestone statue of Pharaoh Seti II, who was to be Ramses II’s grandson. Ramses II is also familiar as Ramses the Great, he was the king who ruled more than 3,000 years ago in the 19th Dynasty. Ramses II is considered by historians to have been the most dominant and revered leader of ancient Egypt. Heading several military expeditions, he expanded the Egyptian Empire, stretching from Syria in the east to Nubia (today it is knownNorthern Sudan) in the south. The area where the two statues were discovered is currently the working-class neighborhood called Matariya, located in the eastern part of modern-day Cairo. But in Ramses period it was known as Heliopolis, which is believed to be the home of the Egyptian sun god Ra and the birthplace of the world. Everytime something new will be uncovered in this part and mysteries will come out to the people to look for,Egypt is always in the news on one or other discovery and it is said to be the city of mysteries. It is said that the Sun God created the world in Heliopolis, and that's what the people here believe that there will be everything important.You will find many monumental statues, temples, and obelisks in Matariya, but kings never lived there because of the area’s ceremonial meaning. Though Heliopolis was mostly destroyed during Greco-Roman times. Many of its temples and obelisks were moved to Alexandria or to Europe. While the researchers have been working in this ancient city for more than a decade now under difficult conditions, as per the American Research Center in Egypt. However, the team will now effort to extract the remaining pieces of both the statutes to restore them. The colossus, if effectively restored and proved to be of Ramses II, then it will be placed at the entrance of the Grand Egyptian Museum in Cairo, opening in 2018.